The eagerly awaited results of the first auction for offshore wind farms in Germany are in. The average subsidy was only 0.44 cents/kWh. But there were also successful bids for 0.0 cents as well as 6 cents/kWh, which is still low from today's point of view. Successful bidders include Dong and EnBW. The capacity being auctioned off on the tender date 1 April was 1.55 GW, and there were four successful bids. The projects, which will all be built in the North Sea, will use 1.49 GW. That is almost all of the available capacity. The lowest bid gets by without any funding at all, and the highest successful bid is for 6 cents/kWh. The Federal Network Agency calculated a weighted average value of 0.44 cents/kWh. That is € 4.40 for a megawatt hour. Bidders will not need to pay for the grid connection themselves, and operation is planned to run for 25 years. Since the wind farms will successively be put into operation through 2025, the bids contain predictions about future technology and market developments. A bid that gets by completely without a feed-in tariff not only shows that significant cost reductions in equipment and installation are expected. Apparently, the expectation is also that the electricity market of the future will pay reasonable prices for power generated at sea. In the view of the Federal Network Agency, the results of the auction are an indicator of the competitiveness of the bidders, as its president Jochen Homann emphasised: "Offshore wind energy has demonstrated its competitiveness. This is good news for all electricity consumers, who are financing the subsidisation of renewable energies through the EEG apportionment." But according to Homann, it is not clear whether such low funding rates will be repeated in the next tender. Commenting soberly on the average value, Homann said: "At 0.44 cents/kWh, the average weighted subsidy value is far below the expectations. This means that the tendering process has unleashed medium and long-term cost-cutting potential that will lead to a completely unexpected reduction in subsidies." North and Baltic Sea projects with a planned total capacity of 6 to 7 GW are eligible to participate in the two tenders in 2017 and 2018. The total capacity being tendered is 3.1 GW. The second tender round, which unsuccessful bidders from the first round can participate in, will take place on 1 April 2018 and comprises 1.61 GW. Due to legal requirements, the Baltic Sea area will receive at least 0.5 GW, regardless of the bids. 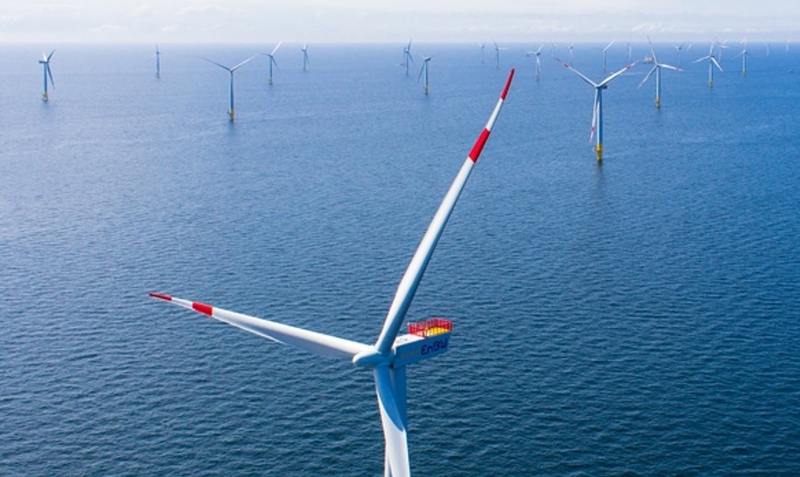 The south German energy giant EnBW was successful with the offshore wind farm He Dreiht, which will be built north of Borkum and will have a capacity of 900 MW. The company announced that its project will get by "entirely without EEG subsidies". The wind farm is apparently relying on positive future developments for volatile producers in the electricity market. "We are very happy with this result," EnBW Chairman of the Board Frank Mastiaux said. "As announced in March at our financial statement press conference, developing renewable energy will continue to be a strategic focus for our company after 2020. By securing the contract for He Dreiht, we have created the basis for long-term growth through 2020 and beyond." The bid shows that market integration of offshore technology by the middle of the next decade is possible. EnBW is expecting the 900-MW wind farm, which is scheduled to go into operation in 2025, to benefit from technological developments and further professionalisation in the wind energy industry. But the company is also relying on economies of scale: As the largest single project in the competition, the He Dreiht project can be implemented very efficiently, not least because of its proximity to the two EnBW wind parks Hohe See and Albatros. "Our planning is based on extensive market analysis as well as comprehensive exchange with the supply industry, which is working on numerous technological advancements and has absolutely internalised cost efficiency. The underlying assumptions about electricity prices are at a moderate level", said Dirk Güsewell at EnBW, who is in charge of expanding the company's generation capacity portfolio.